This unique reference guides readers through this relatively new field of historical inquiry, exploring the varieties and forms of public history, its relationship with popular history, and the ways in which the field has evolved internationally over the past thirty years. Comprised of thirty-four essays written by a group of leading international scholars and public history practitioners, the work not only introduces readers to the latest scholarly academic research, but also to the practice and pedagogy of public history. It pays equal attention to the emergence of public history as a distinct field of historical inquiry in North America, the importance of popular history and ‘history from below’ in Europe and European colonial-settler states, and forms of historical consciousness in non-Western countries and peoples. It also provides a timely guide to the state of the discipline, and offers an innovative and unprecedented engagement with methodological and theoretical problems associated with public history. 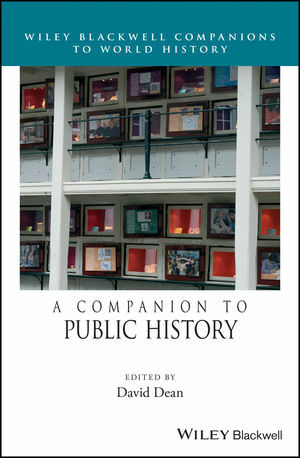 Generously illustrated throughout, The Companion to Public History’s chapters are written from a variety of perspectives by contributors from all continents and from a wide variety of backgrounds, disciplines, and experiences. It is an excellent source for getting readers to think about history in the public realm, and how present day concerns shape the ways in which we engage with and represent the past. Offers some essays in teachable forms: an interview, a roundtable discussion, a document analysis, a photo essay. The Companion is intended for senior undergraduate students and graduate students in the rapidly growing field of public history and will appeal to those teaching public history or who wish to introduce a public history dimension to their courses. David Dean, PhD, teaches and researches public history and British History at Carleton University in Ottawa, Ontario, Canada, where he is a full Professor of History. He is also Co-Director of the Carleton Centre for Public History, a leading research center in the field of public history. He is a member of the steering committee of the International Federation for Public History and co-editor of the new journal, International Public History.